What should a C.V Do? It must highlight your potential and value to an employer. Provide a framework with which an interview can be designed. Provide a vivid account of your achievements as a student and as a professional along with the skills you would bring to an organization, in case you are hired. Although a C.V never ensures an employment, it should at least arouse the employer’s interest and get you an interview call. An effective C.V should be visually appealing. That means it should appear neat and orderly. It should be clear, concise and easy to read. The way, in which the information is presented on paper, goes a long way in creating a favorable first impression. 1.Make sure that you use very good quality paper for your C.V and the covering letter that goes with it. 2.Leave clear margins and be consistent while presenting your information. 3.It should be typed neatly. 4. Be brief and to the point. Do not use ‘ten’ words where ‘five’ will do. However substance should not be sacrificed for the sake of ‘brevity’. Right attributes and achievements should be mentioned and emphasized properly. It is important to present yourself as a valuable candidate for the job advertised. 5. It is advisable to show the finished product to someone well meaning and knowledgeable. Be prepared to incorporate suggestions and changes if they enhance the quality of your C.V.
7.It is of utmost importance to understand the job requirements and your suitability for the post. 8. Highlight areas, where you can contribute fruitfully and effectively, rather than harping on your aspirations. Given below are the main constituents of a Resume. The Information given hereunder need not appear in the same order. Freshers and students may use the same sequence but working professionals may rearrange it to suit their preference and requirements. Note: - You may mention here your professional qualifications or your occupation. It may be written in the descending order, i.e. from the highest degree to the S.S.C examination or in the ascending order, i.e. beginning from the secondary education to the highest qualification acquired by you. Below secondary level education is not to be mentioned. Any additional training, diplomas and special courses undertaken must find place after the main educational details have been given. It is the most crucial information for the employer. If you are already employed or are looking for a change, you must provide information regarding the jobs you have held. Your present assignment, the work experience you have gathered, the responsibilities you have shouldered and the skills developed during the work span, all have to be mentioned here. You may have the best of qualifications but your hands on experience in the relevant field are of greater value to the employer. interest to the prospective employer. 2.Avoid the use of first person, if possible. Trouble-shooting problems arising in the shop floor machines etc. Is not only more appealing; it gives a clear idea of the person’s work and responsibilities at a quick glance. 3.The information should be so organized in this section that it gives a clear idea of your strengths to the prospective employer. 4.In case you have undertaken a number of similar jobs, enlist them under one section, if possible. 5.Salary: - It is advisable not to mention salary at this point. At most an expected salary range can be mentioned. 6.References - These must be provided if asked by the employer. But you must seek permission from the persons whose names have been given as referees. 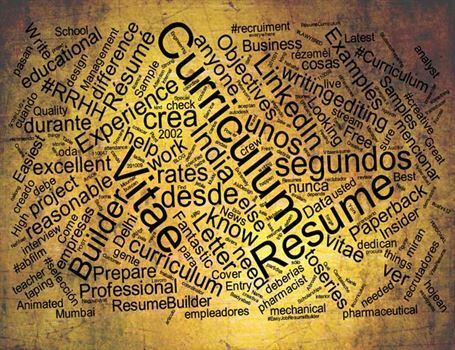 Suggested above is the basic structure of curriculum vitae. There can be several variants of the above-mentioned information. One may reorganize various headings, choosing to begin with very little personal details and devoting more space to the career history and educational qualifications, one’s career objectives, work ethics, specialized skills etc. Actually for an experienced professional these elements should be highlighted and mentioned first of all, immediately after ‘The Name of the Person’. Other details can be given in the end. If you are a fresher and have no work experience to mention, then lay emphasis on your educational qualifications or any other achievements during the school and campus life. The idea is, to present a well-rounded picture of yourself and the valuable differences you can make to the organization, you seek to join.